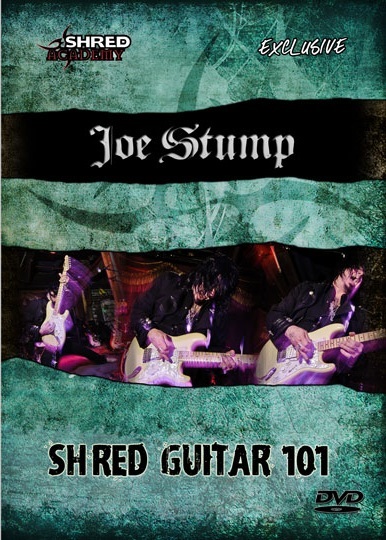 This book, CD and DVD contains everything you need to master metal guitar playing. Learn the fret hand posture you need to instantly increase your stretching on the neck! Follow that with the serious stretch workout and you will be playing insane runs in no time! There is a lot more to warming up than playing a few of your favorite licks. I will show you good muscle stretches and exercises that will help you feel ready for some serious practice or performance. Having problems syncing your hands together? Not anymore! The book contains an excellent routine for coordinating your hands and then creating your own ideas. The sweep picking chapter contains an excellent grounding for beginners and intermediates. Then continues on in Level 2. Build Endurance and Speed! Possibly the most important aspect of playing riffs is the picking hand. These 2 workouts will give you all the speed you could ever want and unlimited endurance! This method is tried and tested by me and many of my students. At the back of the book you will find 2 progress sheets, one for speed and one for endurance. Simply fill them in each time you practice and you will really start to see improvement! What Does A Drummer Have That Most Guitarists Do Not? A Great Knowledge Of Rhythm! 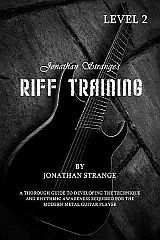 Well fear no longer as throughout the 3 Riff Training courses you will understand subdivisions and displacement better than most guitar players! A whole section on rhythmic displacement. If you don't know what rhythmic displacement is then you are missing out an excellent compositional tool. 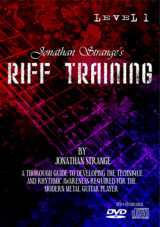 The book contains two 2 hour practice routines specifically for the metal guitar player. Everything you need to practice is in the book! The book finishes with 2 metal tunes/studies for you to apply all you have learned. Both come with backing tracks and are performed on the DVD.